Exactly. I have always been confused as to why we talk about members of “generations” as having meaningful similarities with each other and why we draw the boundaries so arbitrarily. “Many writers have used the succession of cohorts as the foundation for theories of sociocultural dynamics. This approach has been aptly labelled “generationism,” because the writers mistakenly transfer from the generation to the cohort a set of inappropriate associations. Some generationists maintain that there is a periodicity to sociocultural change caused by the biological fact of the succession of generations at thirty-year (father-son) intervals. There is no such periodicity. Other generationists develop a conflict theory of change, pitched on the opposition between the younger and the older ‘generations’ in society, as in the family. But a society reproduces itself continuously. The age gap between father and son disappears in the population at large, through the comprehensive overlapping of life cycles. The fact that social change produces intercohort differentiation and this contributes to inter-generational conflict cannot justify a theory that social change is produced by that conflict. Generationists have leaped from inaccurate demographic observation to inaccurate social conclusion without supplying any intervening causality. All these works suggest arithmetical mysticism, and the worst of them, as Troeltsch said, are ‘reine Kabbala’” (Ryder 1965:853). Good points! Thanks for sharing. If we don’t use the outdated generation labels, how else would we define these differences? I heard that story on NPR, too, and I consciously thought of myself as old since I thought something like, “Are they really bragging that there are more of them? Kids these days.” Also in that story, they took credit for inventing social media, because message boards, the internet and Myspace didn’t exist before Facebook. I love NPR, but I hate being clumped into categories. It’s very convenient, but really? I honestly didn’t know that I was part of Generation X. And, on top of that, I’m the “neglected middle child.” Jeez. Interesting! As a person born in 1981 I’ve seen my year included in the Gen X list and Millennial. There was an interesting article somewhere that I will never find again, about 1981 being a between year- not really this or that and I really agreed. I have always related to a more Gen-X culture, but not completely. I do think there are cultural imprints from a bulk of years. 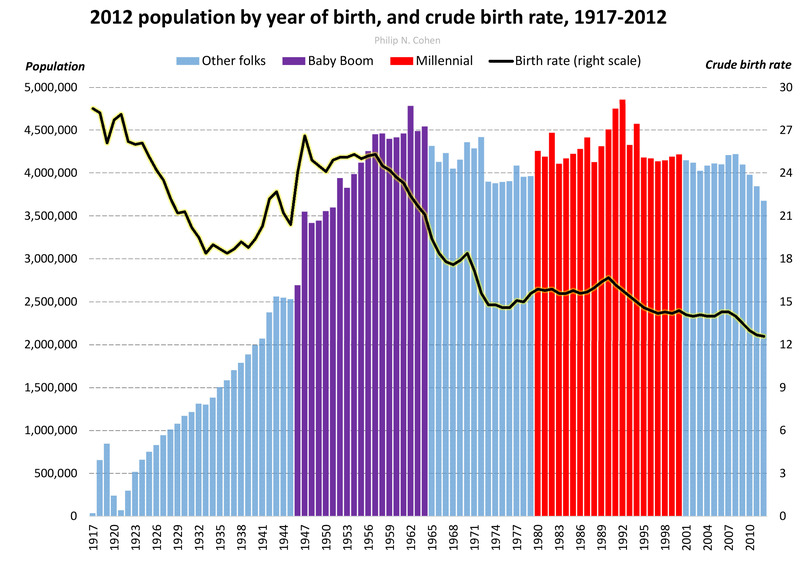 Would people born in 1962- 1965 or so be really having that different of an experience than a 1960’s ‘cohort’? No categories are perfect. Culturally I would say a generation lasts +or- 5 years. Those at the outer edges may share cultural touchstones and thus identity with other generations. While those towards the center will identify with those within their own group more readily. When you start examining those further out you see that ideas transmitted by popular culture differs sufficiently to discern generations. Of course, if we go further back to when media and thus what allows culture to be transmitted was slower to reach enough people to reach enough mass to be considered a generation, we see a shift in the time frame. Indeed without media or a strong tradition of iterent storytelling, this concept of generation becomes thin. But for the purposes of modern(read 100 to 120 years) cultural shifts +/- 5 years works well. I and my siblings were born from 59 to 64. We often find ourselves unable to identify with baby boomers. We are on the edge. Very interesting post, will definitely be referring back to this. Good point about the awkwardness regarding the millenials having “no chronological endpoint,” though I suspect that some decades from now they’ll probably retroactively place an endpoint at something like 2010. Nice job. Liked the graph – 1921 dip begs a discussion. What a great example of the missteps accompanying humanity’s inexplicable desire to label, to categorize, to put people in a box. Good points! I was born in 1981 so I consider myself in both the Gen X and Millennials. I”m still confused. I know what it is in a family (my brothers and I are in the older generation, our kids are in the younger generation). But I don’t know what it is at the population level. I now know what it’s not — it’s not a cohort. But I don’t know what it is. Happily I was born on the planet Earth the same as everyone else. Breaking people into groups is one of the root causes for discrimination.